In Farnham, this pole mounted Beta 8 has finally been replaced with a new pole mount and control box all in Surrey deep green and a Libra, almost 2 years after the rest of the road got new 5m columns and 55W Libras. 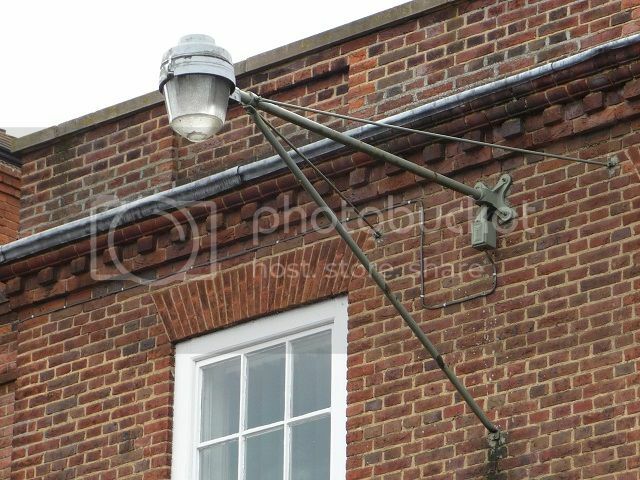 Another pole mount has had the same treatment although one "original" version remains. Not far away, this Revo column has now gone, has have the others behind the camera and ones further up the road with deep bowl GEC Z9554s. Such a shame to see these lovely old things disappear. Main road replacements have moved from Farnham to Guildford. On the A281 Horsham Road south of the town this was replaced today. The A281 has about a 2 mile section of columns being replaced - all the way to Shalford. This will also see the replacement of similar columns with GEC Z9554s. All the columns along this section of the road are excavated with around 10 new columns at the Guildford end. Fortunately the replacements stop just short of the Eleco GR150s at Shalford. Only today, I saw a lorry on the South bound carriageway, laden with full length columns in Surrey's green finish. Not sure if they were Fabrikat or Abacus columns, but they were from Mansfield, Notts. The works have now reached Shalford with new columns with lanterns installed next to those Elecos. Work has also started on the Farnham Road from the railway station to the Hogs Back junction with the A3. In the centre of town it will mean S&L columns with (later) extension brackets to raise their height and SGS203s, will be replaced. Towards the Hogs Back, the columns are unusual as they are mounted on a bank/hedgerow by the side of the road. 20ft/6m S&L columns are used but due to the height of the bank, the lanterns are approximately at the same height as 25ft/8m column. The replacements will be located on the opposite side of the carriageway in the footpath - the excavation holes have already been dug. The Surrey PFI is about to replace some of the last great relics of the county. Work has started in Farnham town centre to replace the GEC Clearmains. Some have gone already replaced by MH Albanies. Many of the Clearmains are on Revo wall mounts and it looks like these are going to be removed. These pictures are from 2009. This example for instance now has a new 10m column against the wall. This example still however remains for the moment. Nearby in Guildford, work has started again on the A281 replacing 6 columns like this that were left when others nearby were replaced in June last year. Meanwhile this 1970s Bergo column has had its bracket cut back and now sports an Indal SON Arc. Other columns nearby have had the same treatment. Those would be nice to save... the wall mounts alone are worthy of saving. The Clearmains have gone from The Borough and South Street in Farnham, apart from a single wall mounted example waiting for removal. 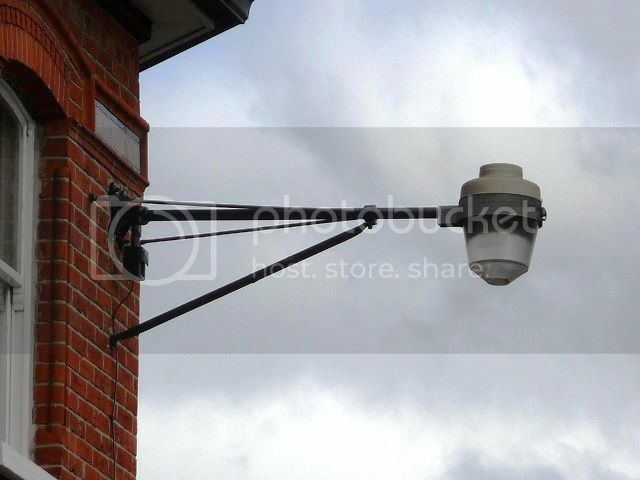 The replacement Albany style lanterns are on new "heritage style" stub wall brackets. Just like the south coast PFI, this means the last lanterns of note are probably all now gone in Surrey. Just thinking about the Surrey PFI, I can't think where there are any streets left to give the PFI treatment now. If I'm right in thinking, the Surrey PFI core investment programme is complete ahead of schedule, unless anybody knows otherwise, with the exception of a couple of missed columns that I'm aware of. In Bramley south of Guildford this GEC Z8896 that still runs mercury has lived a precarious existence for the last few years. The property it is located outside has been having major building works and it could have been side swiped by delivery lorries - in fact the owners had added some coloured safety netting around its base to make it more visible as the GSV image shows. This was latter replaced with orange netting. It did survive the assault by the lorries and the work finished earlier this year. But a few months back it was excavated with notice on the barriers stating "being replaced as part of the Surrey Streetlighting PFI." Then this week the barriers have gone, and the hole filled in but the column is still there and was lit this morning. I suspect it may be owned by the Parish of Bramley and not on Surrey's inventory. There are are however (PFI) Libras on the same road less than half a mile away. So for the time being it lives on. Also likely to be "parish" and nearby is this GEC 5670 also running 80W MBF but rather dim.